Very often mother and child do not set up a group: the mother is the main character while the child constitutes an attribute. Sometimes they are juxtaposed, sometimes there is a coordination between them. With some rare exceptions, the artist does not represent the expression of the maternal feelings, the close emotional ties are seldom mentionned in the sculpture. It's not a representation of an individualized motherhoood, but objects related to the general principle of fertility: the statue belongs to the sacred world, this is why it often takes place on an altar. However, even if the feelings are not expressed, the relation is underlined by the importance of the maternal hands. The " coordination" materialized especially in motherhoods nursing through the physical relationship with the maternal centre. When he's integrated, the child thus forms a group with his mother, but there's almost never exchanging glances between the two. Twinning can be accomodated well or regarded as ill omen. In the African societies, birth of twins is explained by the intervention of the creative god, who wanted to travel by an human form. 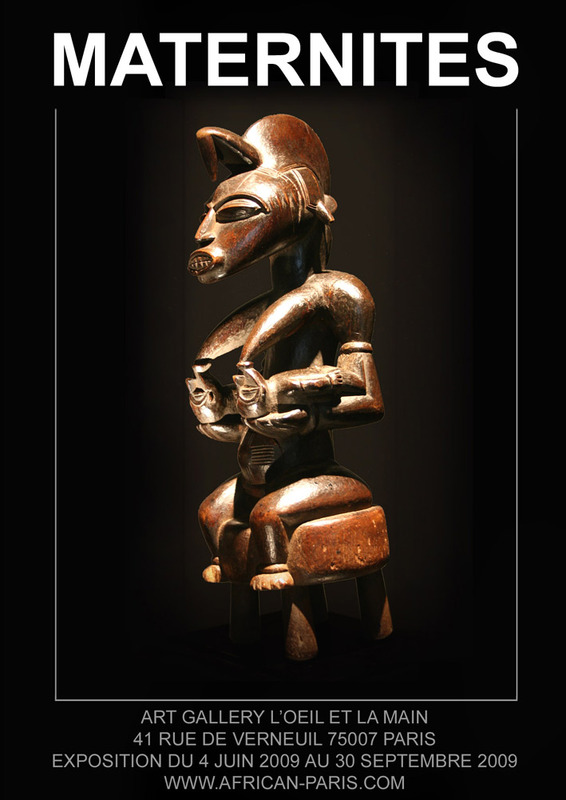 The twins are thus often subjects of a great veneration, even of a worship in some societies (for example the Ibeji of the Yoruba people of Nigeria). Motherhoods including twins represent a filled motherhood and are thus a symbol of fertility.
" Comfortable mothers, painful mothers, radiant mothers, who does not carry them in her heart and does not call upon them in the joy or the sorrow. With ways of expression and of sensibility which are particular to her, Africa devoted to the fertile and protective mother works highly charged with signification". (Therese Houphouët-Boigny, First Lady of Ivory Coast from 1960 to 1993).